Find out how you can graduate debt-free. According to the Federal Reserve, 53 percent of all U.S. adults with a Bachelor’s degree have taken on debt to finance their education. However, the prevalence of student loans has increased in recent years. When looking at only current students and recent grads, you’ll see that 63 percent of those aged 18 to 29 have taken student debt for their undergraduate degree. On average, education-related debt that’s currently owed totals $36,299 per person. That includes student loans, credit card debt, home-equity loans, and other debt related to financing college education. The problem of student debt is growing rapidly. In the past 15 years, the total amount of student debt has more than tripled. In 2001, the total debt owed was $340 billion, and in 2016, it grew to more than $1.3 trillion. This major growth is a result of two things. First, a greater percentage of students are taking out loans to fund educations. Second, tuition rates are increasing, causing borrowers to increase the amount of their debt. The effects of student debt can go far beyond the monetary payments. In a 2015 Gallup-Purdue report, recent college graduates that have student debt are delaying major life events. For those whose loans are over $25,000, the rate of delay increased in each category, spanning 56 percent down to 19 percent. You avoid student debt and its consequences; our blueprint will show you how. To graduate debt-free, start by looking at how to reduce the cost of your education. Choosing a school with a lower tuition is the first step to reducing the amount of money you have to pay. Next, be sure to apply for financial aid. This may seem obvious, but 36 percent of high school grads in 2017 didn’t fill out the FAFSA. For each Pell Grant-eligible student that didn’t apply, $3,583 was left on the table in unclaimed funds. That’s not loan money or work-study funds; it’s free cash that the government didn’t award to students. Additional financial aid options include scholarships and grants. Remember that when applying for additional funding, good grades can be an asset to help you increase the amount of funding you get. The app Frank makes it easy to find free money. On average, Frank finds between $25,000 and $30,000 per student. With each student application, the app searches college aid programs including federal, state, and institutional grants. It’s free to use and only takes four minutes to apply, making it a fast way to earn cash for college. Cutting auxiliary costs such as housing and food can also keep your fees and expenses down. For example, on-campus meals at the dining hall can cost 45 to 69 percent more than typical food budgets. On average, meals in a college dining hall cost about $7.50 per meal or $675 per month. Comparatively, the USDA reports that the U.S. average for food expenses is between $209 and $370 per month for low-cost to liberal food plans. Thrifty adults can spend as little as $165 per month on food. There are several ways to cut college housing costs. First, consider becoming an RA. It’s free room and board, but be prepared for the work involved. Another option is to look into off-campus housing. Depending on your city’s housing market, you could save $219 per month. Taking on an extra roommate is another way to save. You could save $200 per month by splitting a $1,200 apartment three ways instead of two. There’s also the option to live with family while going to college. In 2018, 37 percent of students were living with relatives, the majority of whom didn’t pay any rent. Unlike those living in the dorms, this option does add a commute to your day, and you may have FOMO because you’re not living on campus. However, you’ll also keep more money in your pocket. A side hustle can help you earn extra money, but it’s important to decide how much time you’re willing to put in. Low time investment side hustles are a way to make money for things you’re doing anyway. A great example is note-taking. You’re already taking notes in your classes, and uploading them to a note-sharing platform such as OneClass can earn you extra money. Another option is to use the health/fitness app, Achievement, which will pay you for tracking steps, sleep, and meals. You can also get paid to play video games by using apps such as Twitch. Moderate time investment side hustles let you work as much or as little as you want. The example that many people think of is becoming an Uber driver or delivering food for Postmates. Many students also sell things online. Clothes can be sold on Poshmark or thredUP. Crafts can be sold on Etsy, and other items can be sold on Letgo, eBay, and Amazon. An option unique to college students is to make money tutoring. No longer do you have to seek out fellow college students to work with. By using online apps such as Solvit, tutors can make $20 per hour and be instantly connected with students needing help. High time investment side hustles will require that you dedicate yourself to your gig. For example, freelance contract work is a great way to leverage your skills for one-off projects. Using apps such as Fiverr, MTurk, or TaskRabbit, you can use your skills to build websites, design brochures, become a social media influencer, or do something else. There’s also the option to make money on Airbnb by renting out an extra bedroom in your apartment or renting your whole place while you’re on break or traveling. Fair warning: Managing guests and cleaning will probably take more time than you realize. If your side hustles aren’t enough, a regular paycheck may help. Many students get a part-time job. On average, work-study students earn $2,353 per year for part-time work. Restaurant and bar work can be profitable, and bartending averages $25 to $35 per hour, after tips. Keep in mind that your wage depends largely upon the place where you work. Using this hourly wage calculator from FiveThirtyEight, you can see how restaurant server income compares based on location, busyness, and customer tip amounts. About 25 percent of student workers juggle a full-time job while going to school full time. It can be tough to manage the time and responsibilities of working while in school. Summer jobs and internships are also a great chance to make money; in 10 weeks of seasonal work, you can make $4,668. Pro Tip: Don’t forget to use the Tuition and Fees Deduction to reduce your income taxes on money earned. Your grades can affect how much you spend on college. For example, poor grades could end up costing you money if you have to retake classes you didn’t pass, if you lose your scholarships because your grades slip, or if it takes you longer than four years to finish. Keep in mind that a key part of graduating without debt is actually graduating. One financial aid rep sees a correlation between graduation rates and number or work hours during college. Students working between one and 12 hours per week had a higher graduation rate than students who didn’t work at all. However, the graduation rate starts for drop for students who work more than 12 hours per week. Money-related issues comprise the top two reasons students drop out. For 54 percent of students, the main reason for dropping out is to work and make money, while 31 percent said they couldn’t afford the tuition and fees. Because there are a limited number of hours in the day, it may take some effort to juggle the time you spend earning money and the time you spend on classwork. 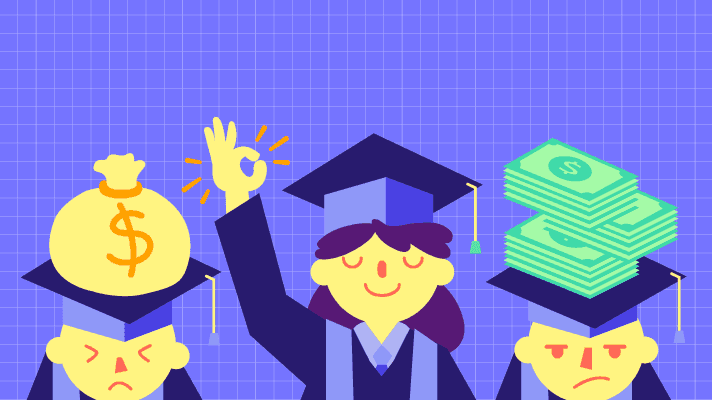 Using this guide to lowering your student debt, you can make smart decisions to reduce your expenses, get the most financial aid, and earn money for things you’re doing anyway. Don’t have enough time for studying? Use online tools such as class notes from OneClass to be more efficient with your study time.